Set yourself apart with the colorful personality of the Paper Mate Vitality. The vibrant grip, trim, and barrel colors are sure to increase the visibility of your message. 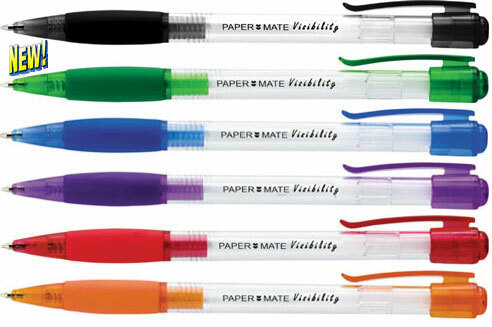 With the striking clear barrel or colorful translucent barrels and a trendy rubber grip, the Paper Mate Visibility is fashion at an affordable price. Colored comfort grips for writing ease and style. Refillable for a long life. It's colorful, comfortable, and visibly cool! Paper Mate Visibility can be customized with a multi-color imprint. Set yourself apart with the colorful personality of the Paper Mate Visibility! 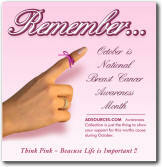 The vibrant colors are sure to increase the visibility of your message. And now you can get the Paper Mate Visibility that everyone loves in both clear barrels and NEW colored barrels! Show your true colors with the Paper Mate Visibility. It's colorful, comfortable and visibly cool! New comfort grip on translucent barrel version! VTTB-Visibility/Translucent barrel/Ball pen (Barrel colors: Translucent Red, Blue, Green, Orange, Pearlized Pink & Purple. Choose the Paper Mate Breeze when you need a smooth operator. Experience the Paper Mate Visibility with Your Branding. The Paper Mate policy of customer satisfaction guarantees a replacement of your new Paper Mate writing instrument should it ever fail to perform to consumer's satisfaction. Please contact Paper Mate for more details.